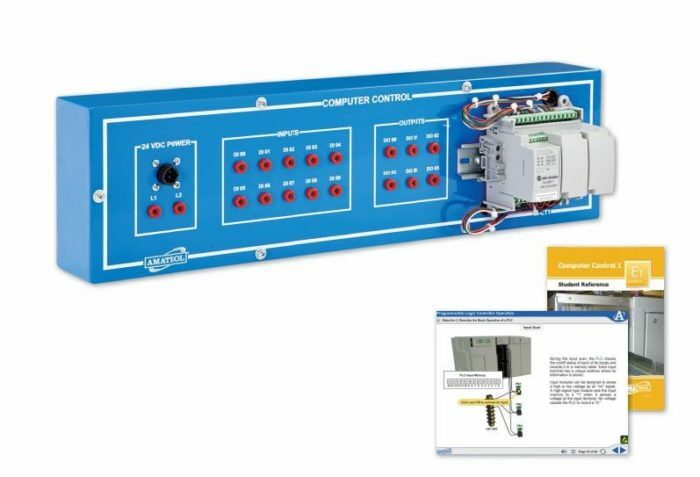 Amatrol’s Computer Control 1 Learning System (96-CT1) teaches users how to program, operate, and interface programmable logic controllers (PLCs) in a variety of industrial applications used in many industries, such as automotive, packaging, and technological assembly. The PLC remains an important tool in industrial automation, useful in a wide variety of applications like robots, conveyors, electric motor controls, air conditioning, process control, plastic injection molding, and CNC machines. The system features an Allen-Bradley Micro820 PLC. It can be mounted to either the Electric Relay Control Learning System (90-EC1A) or the Electrical Control 1 Learning System (96-ECS1) to provide control of real-world electrical and pneumatic application devices. The system’s PLC I/O terminals are wired to heavy duty banana jacks, allowing learners to quickly connect the PLC to other devices. Using the system’s robust interactive multimedia curriculum, users will learn PLC skills while practicing with real-world equipment. The PLC training system teaches learners PLC operation, programming, and event sequencing using real-world equipment like an Allen-Bradley Micro820 PLC with ten inputs and six outputs. The system integrates seamlessly with either the Electric Relay Control Learning System (90-EC1A) or the Electrical Control 1 Learning System (96-ECS1). The combination of these learning systems allows learners to see how manual switches can be replaced by a PLC to create automated sequences by practicing skills like wiring input and output devices to a PLC and designing an actuator and motor sequence PLC program. Amatrol’s curriculum features a highly-interactive, multimedia format that includes stunning 3D graphics and videos, voiceovers of all text, and interactive quizzes and exercises designed to appeal to learners with different learning styles. The PLC training curriculum teaches learners about a wide variety of PLC topics and skills. For example, learners will study PLC operation, programming, and event sequencing. They will then practice hands-on skills, such as designing a PLC program to jog two motors and creating a continuous cycle clamp and drill sequence PLC program. The combination of theoretical knowledge and hands-on skills solidifies understanding and creates a strong basis for pursuing more advanced skills. Users who want to broaden their PLC knowledge can expand their system by adding Computer Control 2 (96-CT2), a multimedia course that covers a variety of advanced PLC topics, including application development, PLC timer instructions, and PLC counter instructions. Learners will also be able to practice hands-on skills, such as designing a PLC program with both Halt and Cycle Stop functions, entering and editing a PLC program that uses a TOF instruction, and designing a PLC program that controls a conveyor queue station. A sample copy of the Computer Control 1 Student Reference Guide is also included with the system for your evaluation. Sourced from the system’s curriculum, the Student Reference Guide takes the entire series’ technical content contained in the learning objectives and combines them into one perfectly-bound book. Student Reference Guides supplement this course by providing a condensed, inexpensive reference tool that learners will find invaluable once they finish their training, making it the perfect course takeaway.